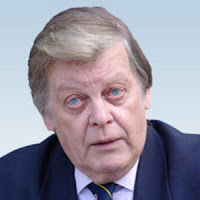 I am bringing this from Rehmat's World Site posted under: "Alan Hart: Israel has no right to exist"
Alan Hart said: "Israel has no right to exist unless it was recognized and legitimized by those who were dispossessed of their land and their rights during the creation of the Zionist state." My Problem with Alan Hart is his "But". 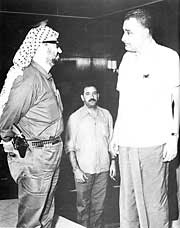 He claimed that the Palestine file was closed with the Israeli 1948 Victory, that Arafat re-opened the file. No Sir, the Palestine file was not closed in 1948, nor was re-opened by your Friend "Father Palestine"
Your other Friend Golda (Mother Israel), though she denied the existence of my people, she knew that Israel her daughter is doomed and "has no right to exist unless it was by those who were dispossessed of their land and their rights during the creation of the Zionist state". "Father Palestine" used resistance to undermine the Arab nationalist's movement, and when done, He move to undermine the Resistance and the first Intifada on his long way to close the Palestine File. He failed and was killed for his failure. I am not going to repeat what I wrote commenting on your Article: Annual Nakba Commemoration Dinner Speech. I posted your speech at my blog, and placed a link to it at your site. The Link never appeared because you want us to believe that your Friend "Father Palestine" reopened the Palestine File, closed in 1948 war as you claimed. Here as Nahida rightfully said you're putting us between two options, Sampson's option or the so called "two-state solution". Even though 30 years ago you’ve "come to the conclusion that it’s all a myth, Israel’s existence has never ever been in danger" and while telling us about the sad smile of your friend "the brightest of Israel’s Directors of Military Intelligence, Major General Shlomo Gazit. And the problem of Israelis becoming the victims of their own propaganda, you are, after 30 years and the "heroic" death of your "Father Palestine" are still spreading the Israeli Propaganda of the two state solution, and peace with the Nazi-like Israel’s extreme right wingers. "Without the shortest of pauses for reflection, and in the gravel voice that could charm or intimidate American Presidents according to need, Golda replied, “Yes, that’s exactly what I am saying.” "
Being probably the "only person on Planet Earth who enjoyed intimate access to, and on the human level friendship" with, both "Father Palestine" and Mother Israel", being the Linkman between Shimon Peres and "Father Palestine", and taking into consideration your hard work for years to get "the two greatest opposites in all of history" into Oslo (Offcourse after the Assassinations of Key Fateh Leaders, Abu Jihad, Abu Iyad, abu Al-houl), and having read your recent articles, and your "favorite stories about the two greatest opposites in all of history – Yasser Arafat, Father Palestine, (*FATHER OSLO) and Golda Meir, Mother Israel." I feel that you care for the Jews more than you do for their Victims. Even now, after 3 decades you care for the brainwashed Jews, and hoping your book if translated to Hebrew would save the Brainwashed Jews from their enemy, the Zionism. After 30 tears you don't dare to say Israel is a cancer. Instead you said “The Israeli-Palestinian crisis is a cancer at the heart of international affairs that has the potential to consume us all unless it’s cured. Every man, woman and child has a stake in it.” and still using your protective shield. 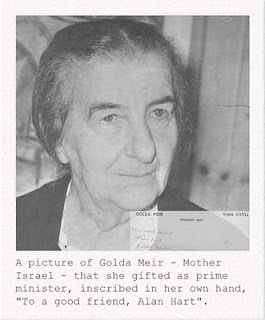 the Picture of Golda. "When I was accused of anti-Semitism, I would hold up the picture, read out Golda’s inscription, and say to my accuser – “Do you think that old lady was so stupid that she couldn’t have seen through me if I was anti-Jew!” That always won me the applause of the audience and its contempt for my accuser." 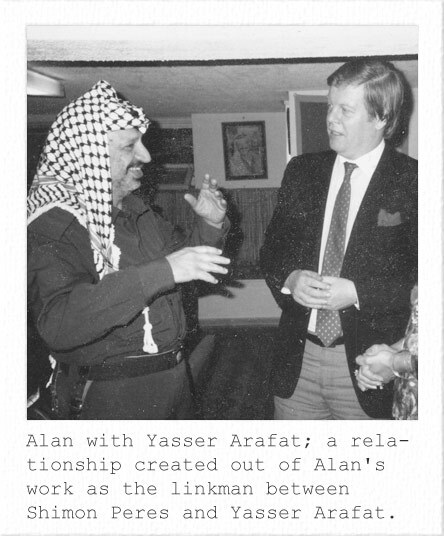 Yes Sir, "Zionism’s colonial enterprise was doomed by its failure to keep the Palestine file closed." The two greatest opposites Mother Israel and "Father Palestine" failed to close the file, and it will only be closed by Uprooted Palestinians, Resistance, armed and popular, the International freedom movement and proud self- hating Jews like Gilad Atzmon, who come from them, and he know how they think. “The Zionist state which came into being as a consequence of Zionism terrorism and ethnic cleansing had no right to exist and more to the point could have no right to exist unless it was recognized and legitimized by those who were dispossessed of their land and their rights during the creation of the Zionist state. In international law, only the Palestinian could give Israel the legitimacy it craved….” Alan Hart, British Television journalist and author of the book Zionism: The Real Enemy of Jews and others, wrote to British Prime Minister David Cameron in August 2007 when the later was leader of Conservative Party. “The assertion/claim that Iran, even if it did have nuclear weapons, would pose a threat to Israel’s existence is nosense – in my view out of truly mad minds. If Iran launch a first strike on Israel, it, Iran, all of it, would be destroyed (by 400 Israeli and 9,000 US nuclear bombs). No Iranian leader would be that stupid. The real problem for Israel’s leaders, if Iran did have an atomic bomb or two or several – and that’s still a very big IF – is that they would no longer enjoy more or less complete freedom to impose their will on the region,” Israel Shamir, a Russian-Israeli writer. Alan Hart has just concluded his speaking tour of the US and Canada. 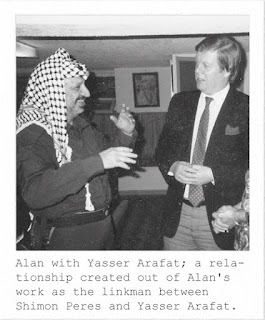 While in the US, Alan appeared on Dr. Kevin Barrett’s Radio Show, in which he said that Washington and Tel Aviv were behind the September 11, 2001 attacks in New York. “The Palestinians’ struggle for justice, and refusal to be broken by the brutality of the Zionist occupiers, is the cornerstone which all people who care about justice stand on”. “Judaism is the religion of Jews, not ‘the’ Jews because not all Jews are religious. Like Christianity and Islam, Judaism has at its core a set of moral values and ethical principles. Zionism as Jewish nationalism is a sectarian, colonial ideology and enterprise which, in the process of creating, in the Arab heartland, a state for some Jews – mainly by terrorism and ethnic cleansing – made a mockery of, and demonstrated contempt for, Judaism’s moral values and ethical principles”. May God bless the eternal nation of Israel! Afghanistan looking more like Lebanon? 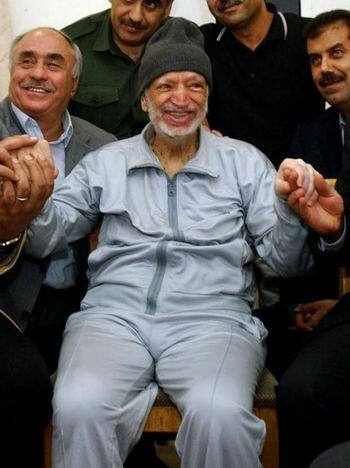 Can You Pass The Hamas Quiz?